Blog Diddy Promises to Visit Nigeria After Meeting with Wizkid, But Can he Stop with his Condescending Treatment of African Artists, Already? Diddy Promises to Visit Nigeria After Meeting with Wizkid, But Can he Stop with his Condescending Treatment of African Artists, Already? Diddy recently met with Wizkid, at Diddy’s mansion in Los Angeles and felt so ecstatic about the meeting, he just had to share the news on Instagram. He also provides captions in case we all missed it. Diddy then took it a step further by promising he would be “coming back home” to the Motherland and he would not “wait too long” to visit. Diddy “the God”, I think, really believes that if he shares an Instagram video of himself dancing to Fela Kuti or giving shout-outs to popular African artists of the moment (Mr. Eazi, Falz the Bad Guy, Wizkid etc. ), then he can avoid scrutiny on what exactly he is doing to be down with Africa’s entertainment industry and artists, the way he seems to want to claim he is doing. Diddy has a pattern and practice of being this patronizing with African artists. In July 2014, nine months after the launch of his Revolt TV and Revolt Music Conference (RMC), Diddy had the chance to meaningfully engage with Africa’s industry and its artists with collaborations etc., and in so doing, help put the industry on the global map. He didn’t. Instead, we saw him professing his love for Nigeria, dubbing himself “Oluwadiddy,” and simply exploiting and soliciting subscription to Revolt TV through sound-byte type interviews Revolt conducted with Nigerian artists Davido, and Tiwa Savage during their visit to the states for the BET awards. In fact, Diddy was persuasive enough to have Davido, a rising global star at the time, wear all Revolt TV branded clothing to market Revolt to Davido’s massive audience, all allegedly at no cost to Revolt. 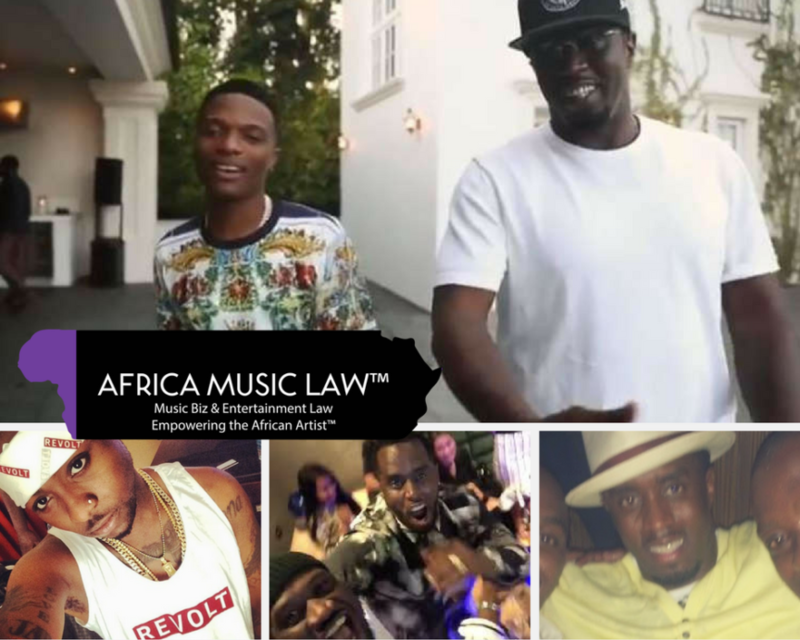 To date, neither Diddy, Revolt TV, or Revolt Music Conference, have had a true dialogue with Africa’s entertainment industry on the issues that affect it, collaborations and partnerships, and monetization of its intellectual property assets in a mutually beneficial way. So, the reality is that unless there is substantial revenue flowing from Africa to Diddy (like Diddy’s 2017 Revolt-Kwesé TV broadcasting rights deal), or a potential exploitation of African artists to significantly benefit Diddy (whether through publicity or otherwise), Diddy couldn’t be bothered about Africa. Diddy’s lack of genuine respect and interest in Africa’s artists and entertainment industry is underscored by the fact that in the four years he has been busy paying lip service to Africa and its talents, Jay-Z’s Tidal has launched in Nigeria, Jay-Z has signed Tiwa Savage to a Roc Nation management deal in the states, Sony has launced in Nigeria and signed recording deals with Davido and Wizkid, and Universal recently launched in Nigeria and signed several Nigerian artists. These groups doing business in Nigeria is not without its challenges, including from the talent side. But, at a minimum, they are puting their mouths where their money is. So, can somebody please tell Diddy to miss Africa’s artists and its entertainment industry with his condescending statements and patronizing conduct, already? Thank you. If only Diddy knew the truth, he wouldn’t waste his time trying to finesse some clout through Ayo. Bad Boy Entertainment is historically a rap label. With all the great rappers in Nigeria, Diddy hasn’t attempted to sign even one of them? It shows how easily fooled and led people can be. One day, friends . . . one day the facade that is this “Wizkid” persona will crumble, and we’ll see who stands by Ayo then. All this hype– and for what? Where’s the classic records? Where’s the classic albums? I don’t care if he knows Drake, Diddy, or whomever. I’m not buying the hype. All these weak songs sound the same coming out of that camp. And the songs won’t stand the test of time because they’re not even really hot songs in the present. Nigerians have a history of propping up the artists with the biggest buzz and granting them lifetime status of fame, despite the dwindling musical output and relevance. That’s why we still get crap releases from 2Baba, P-Square boys, and D’banj. Ayo will be the next one who sticks around annoyingly for years to come.